I miss the days of visible polygons and lower polygon counts. Do people even talk about polygon counts in reference to gaming anymore? I honestly wouldn't know because it has been a while since I sat down and read a review online or in a magazine. In the mid-to-late 90's, a game's polygon count was considered a pretty important measurement of quality, both in terms of "realism" and hardware capability. These days, games and hardware are so advanced that the visible polygon seems to have already slipped into obscurity due to modern, graphical processing power. Whereas the pixel is still revered as a viable medium for throwback and retro-style gaming, the visible polygon seems to be quite under-loved in my opinion. While I can't wait to see how far technology will be able to push the recreation of reality through virtual means in our lifetime, I must admit that I've never been as interested in photorealism as I am in surrealism. I will say, however, that it is damn impressive and quite shocking when you are fooled into believing that something which is not real, in fact is. The artist Chuck Close is a master of this. His paintings (which are awe-inspiring in physical scale) bend your mind and stretch your skull with how realistically they've been rendered - his earliest works appear to be enormous photographs from afar, but are actually the some of the most meticulously painted pieces I've ever seen. Even up close, it's very difficult to distinguish the individual brush strokes that make up the entire picture. However, Chuck Close suffered a tragic and spontaneous spinal artery collapse that left him confined to a wheelchair for the rest of his life after one of his gallery openings in the late 80's. Despite this great difficulty, he refused to give up painting, and developed new ways of going about his work so that he could continue to create. Because of this change in technique, there's an interesting shift in graphical fidelity that occurred in his work, which made it even more astonishing and beautiful in my opinion. Once he began painting with the use of long brushes attached to his wrists and arms, his work took on a more pixellated look. The simplification of his technique was necessary to cope with the difficulty he had in moving, and what resulted is like a kind of impressionistic-realism. From afar, images still appear to be photorealistic. Up close, they are plotted grids of energetic bursts of color and brush strokes - very different from what they appear to be when perceived at a distance. His work evolved into something that was simultaneously "real" and "unreal." You could enter a gallery space and marvel at the "realness" of a piece of his from afar, and then venture up close to reveal the nuts and bolts of the picture's inner-workings. That union of duality is what makes his later work so interesting and cool to me. I expect that many "art-people" would find it abhorrent to try and compare the use of polygons and vector graphics in video gaming with the use of bold, visible brush strokes in established, impressionistic works of art. However, both are interesting ways of creating a depiction of something that appears real, yet doesn't fully hide what it truly is when you look close enough. I began this post with the classic "eNOS LIVES" Sony Playstation commercial and the floating-head Sega Saturn bit from the mid-90's because I feel that moment in gaming did a lot of interesting things as the technology was evolving. Some of those early Playstation and Saturn games aren't the easiest to go back to today, or haven't aged particularly well, but the good ones are damn good, and the simple geometry is still very evocative of so much more than what the shapes really are on their own. Despite the fact that your eye is seeing a series of shapes and simple textures, your brain fills in the gaps and connects the dots so you are able to imagine the full impression of the reality that the game is alluding to. It's not a matter of suspension of disbelief for me - it's full-on play between illusion and imagination. Polygons and vector graphics were used well before the heyday of the Playstation and the Saturn though. I recall spending many a quarter on Atari's classic, sit-down Star Wars arcade cabinet as a wee lad. I mean, come on. Look at that game! That's almost 30 years old, and it still looks great and plays well today. Just simple lines and shapes, but you're there - you're Luke in his X-Wing, destroying wave after wave of Tie Fighters, waiting for the right moment to bullseye the 2-meter-wide womprat of a thermal exhaust port along the iron valley of the Death Star's surface. This honestly might be the best Star Wars game ever created. And it's just lines and shapes. Man. What in the hell is going on in I, Robot? What does it have to do with Asimov's story? I have no idea, but dear god - I love it. It's just so nonsensical and weird. And again - 30 years old. Star Fox is really, really important. Not just to me personally, but to gaming in general. It lived up to the hype, and bridged that gap between the arcade and the home system in ways that no other game before it could, because it included the Super FX chip, aka, a seriously badass graphics accelerator inside the cartridge which allowed the SNES to manage the visual demands of the game. If you've never played Star Fox before, please, do whatever you can to play this game. The harmony of music, sound effects, controls, environments, colors, shapes, super surreal and weird secrets, the iconic gibberish-voices of the characters, the allusions to Japanese folklore... it's all still so awesome to this day. This game feels incredibly modern, and I will likely spend a lot more time talking about it specifically in another post at some point. Personally, I don't like the direction that the Star Fox series took after this game - Star Fox 64 has its moments, but I feel like that game tried way too hard to fill in the blanks for the player with more detailed graphics and voice acting, whereas the original had plenty of room for your imagination to take over and see the rectangular monoliths strewn about the surface of planet Corneria as futuristic skyscrapers, or the angular abominations on planet Venom as terrifying mutant-creatures. I can only imagine how much cooler a Star Fox sequel would have been on Sony hardware if Nintendo had followed through with their Playstation CD attachment for SNES. It seems like ever since the death of the Sega Dreamcast and the end of the PS2 era, a lot of game developers and designers have been racing to make game experiences that are more "real" than the other guy's, and are less conscious of still being a game. While I don't mean to shake my proverbial old-man cane and stand in defiance of inevitable change, I deeply miss the magic that was created by overcoming the limitations of technology and hardware through unique art direction and clever implementation of graphics that evoked the real at a distance, while remaining obviously unreal up close. 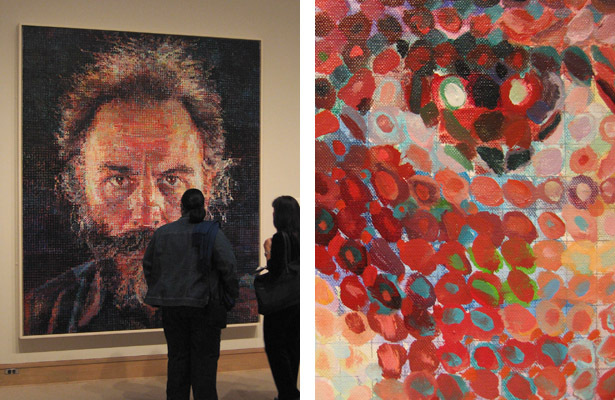 Like Chuck Close, who refused to stop painting after his whole life was so drastically altered, challenging obstacles fostered and encouraged the development of a creative process that gave rise to exciting, beautiful, and extraordinary results. Not to diminish the human weight of the struggles that Chuck Close faced by comparing them to video gaming, but it's true that the greatest growth results from overcoming the most difficult of struggles. In a time when it seems almost anything is possible, what great leaps are left to be made in video gaming? Hopefully there will be more to it than motion and voice controls. Perhaps we may begin to see a revival of the rudimentary polygonal graphics in indie gaming, much like we do with pixellated 8 and 16-bit-style games today. I'm looking forward to talking about some of my favorite, early Playstation games over the next few weeks, starting with a terrific one: Jumping Flash! After all, this is Pixel / Polygon!